The all-new 2014 Mazda3 Sedan details with video have been released ahead of its U.S. launch this fall. Mazda has revealed the first images, details and video of the all-new 2014 Mazda3 Sedan and it looks impressive. When the 2014 Mazda3 goes on sale later this year, the model lineup will again include the hatchback that was unveiled last month in New York and four other locations around the globe, and also the new 2014 Mazda3 Sedan. The new fastback version will be longer, lighter and more aerodynamic than the the hatchback. The new Mazda3 fastback will share the full range of lightweight SKYACTIV technology with its new-generation siblings Mazda CX-5 and all-new Mazda6. The new Mazda3 will be the next model to get the new i-ELOOP fuel-saving technology that could be a game changer for the Japanese automaker. It also gets Mazda’s KODO “Soul of Motion” design language that also fits well for the smaller C-segment model’s size and agility. The new Mazda3 Sedan and hatchback are 1.5 inches wider and .59 inches lower than the outgoing model. But the Sedan features a different roof, rear window, rear wings and trunk lid in a design which extends the overall length by 4.7 inches to 15 feet, compared to 14.6 feet for the hatchback. The Sedan is more aerodynamic and has a low-drag Cd 0.258 compared with 0.275 for the hatchback. This should translate to better fuel-efficiency for the new fastback. Other differences over the outgoing models include the new “clean” design aerodynamically, and the new 2014 Mazda3 is lighter, 2636 lbs (fastback) and 2645 lbs (hatchback), making it one of the lightest C-segment cars. And this is after Mazda added bigger brakes and bigger wheels to the all-new Mazda3. Trunk capacity in both models has been increased by 2.4 cubic feet with ability to carry three large suitcases for greater utility. Mazda has not released fuel-economy numbers, but this combination of low drag and lower weight along with the efficient SKYACTIV engines and transmissions should enable the new Mazda3 to deliver some excellent fuel economy figures. The new sedan will likely be the more popular model with U.S. buyers because of its efficient performance and pleasing design. The European models will feature three choices of naturally-aspirated engines and one turbocharged diesel variant. U.S. models will come with two gas powerplants, a 2.0-liter four-cylinder engine rated at 155 horsepower and lb. ft of torque and a more powerful 2.5-liter four-cylinder engine rated at 184 horsepower and 185 lb. ft of torque. Both engines will come mated to either a six-speed automatic transmission or six-speed manual gearbox. 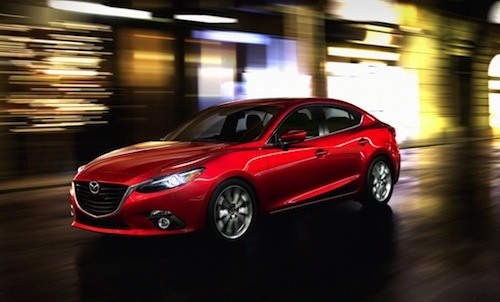 Look for the all-new 2014 Mazda 3 Sedan and Hatchback to be in showrooms this fall. Pricing will be announced closer to the launch of the sporty new model. Next will be the launch of the performance model 2014 Mazdaspeed 3. Watch All-new 2014 Mazda3 video.